If the thought of eating a witchetty grub or a scorpion makes your skin crawl then you might need to get used to the thought pretty sharpish, at least according to some experts. By 2050, the population of the world is expected to hit 9 billion people. And that’s a lot of mouths to feed. Experts believe we will have to turn more and more to entomophagy, or using insects as food, in order to sustain humanity. The diets in high-income countries filled with meat, which are being replicated in low and middle-income countries, doesn’t seem sustainable considering the toll it takes on the environment and on our health. And when you consider that snails are a delicacy in nations including France, people in Thailand already happily tuck into grasshoppers and crickets, and not much separates a prawn from a scorpion, then it all seems a lot more palatable. (Sort of). There are also health benefits to tucking into creepy crawlies. There are around 27g of protein per 100 grams, but between 35 to 48g in chapuline grasshoppers. And insects take up a lot less room than bigger livestock, like chicken, cows and pigs. In addition, most countries have access to or can import edible insects, with countries including Australia, China, and Mexico having a particularly large variety already available. 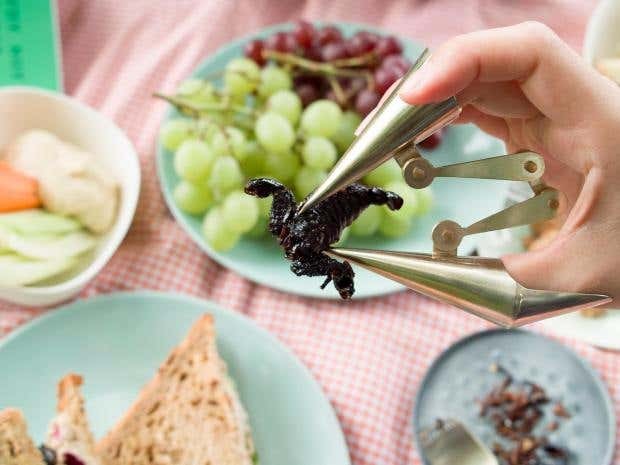 Designer Kobayashi Wataru is offering a small solution to the problem of making insects seem palatable for cultures where they aren’t yet widely eaten which his creation BugBug utensils. The range, which isn’t available in shops, includes especially designed chopsticks, a spork for picking up bugs, and a set of claws which slide over the fingers and help when eating bugs like crisps. He won UCL’s Institute of Making ‘Cutlery Design Challenge’ with his design last year. But he says that people who have interacted with his project haven’t been entirely convinced to ditch their chicken for insects. Not yet, at least. “I saw a girl covered her mouth while she was looking at the BUGBUG project,” he says of an incident when he was showing his work at the New Designers festival in London last year. At the same time, his work has also sparked debate. People have been surprisingly accepting, he says. Those who are keen to get stuck in, he adds, shouldn’t attempt to eat bugs without doing some research beforehand. He says he was inspired by ancient objects like stone axes and hand tools, as well as cutlery used to snap open crabs and scoop the flesh from snails. CARTOONIST UNDERSTOOD TYRANTS AND BUFFOONS–Why is the U.S. in 2018 unable to understand tyrants and buffoons in our political system?